There is a show on television called NCIS. The main character on the show is the leader of an investigative team. He often makes decisions that go against conventional wisdom, but they always turn out to be the right decision. He says he always “trusts his gut.” This method of problem solving works great for a character in a television show where there is a script that can be written and followed, so everything can work out fine in the end. In real life, however, things are decidedly different. When we say we are “going with our gut,” it means we are going with what “feels right” to us. There are times, however, when what “feels right” is not the right thing to do. Proverbs 14:12 says, “There is a way that seems right to a man, the end thereof is destruction.” We can’t always trust our gut, and it can often be dangerous if we do. Spiritual discernment is when we hear and understand the voice of the Holy Spirit in our spirit. It may seem like a thought in our head, a feeling in our heart, or a sense in our gut, but it is actually far greater. The Bible says God is a rewarder of those who seek Him, and that if we seek, we will find Him Find a reference verse (Hebrews 11:6). Making decisions based on God’s truth is always the best idea. 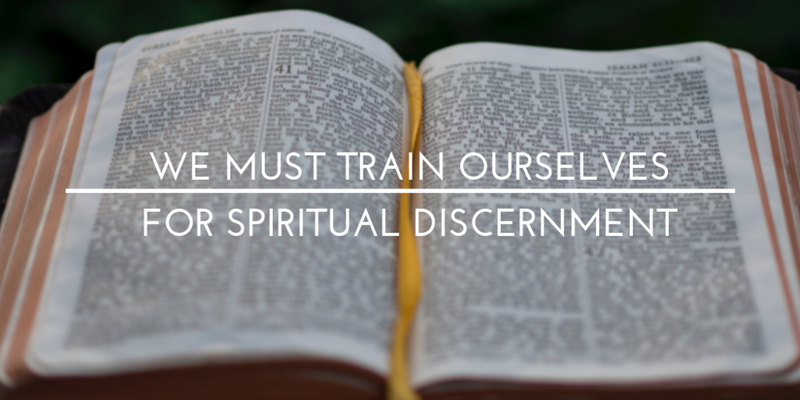 It is important, though, for us to train ourselves to hear and discern the voice of God. We must learn how to listen for His voice in the midst of all the many noises in the world around us. We should follow the example of Jesus who would often go to a place where he could be alone so he could spend time in communion with the Father. If it was important for Jesus to practice solitude and silence, maybe it is something we should consider ourselves. One vital component to hearing the voice of the Spirit is knowing the truths written in the Bible. God will not speak to us in our spirit with a word that is in disagreement with what He has already told us in His written Word. I guess it is okay to “trust your gut,” as long as you make sure your “gut” aligns with The Word of God. That is the one truth we can always trust.